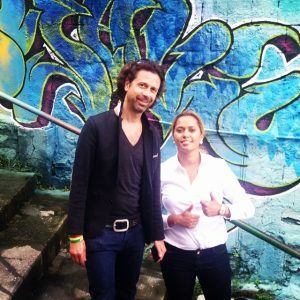 Panmela Castro and Yann Borgstedt in Rio de Janeiro posing before a graffiti wall in Catete. Panmela uses graffiti to advocate for women’s right to respect and freedom, through the work of her NGO Rede Nami. Yann’s foundation Womanity supports the development of her organisation under the WomenChangeMakers fellowship programme. The programme is supported by professional partners like Accenture and Egon Zehnder, and funded by donors like Hublot and the Trafigura Foundation.